Jason Monteiro September 25, 2018 January 24, 2019 No Comments on Mutual Fund SIPs in the Red? Here’s What You Should Do! Investing in equity mutual funds through Systematic Investment Plans (SIPs) are an ideal way to deal with the market volatility. While SIPs may help to average out the cost of your investment, they may also underperform the underlying fund on a point-to-point basis and even deliver negative returns over a period. For example, over the past year the Nifty 50 generated a return of 16%. However, out of the 34 large cap schemes, investments through an SIP in 5 schemes delivered a negative return. The average returns of the SIP investments in the 34 schemes worked out to less than 10%. Investors would have been disappointed with their investments in mutual funds through SIPs. Out of the 193 open-ended equity funds, as many as 71 funds (or 37%) delivered a negative SIP return over the period between October 3, 2017 and September 17, 2018. Over the same period, the Nifty 50 generated a return of 16% on a point-to-point basis, while the Nifty MidCap 100 index generated a return of 6%. The broader Nifty 500 index returned 12.74% and the Nifty Smallcap 100 index traded in the red with a return of -2.42%. A number of schemes in the mid cap and small cap categories ended up with negative returns. Surprisingly, a few Large Cap and Multi Cap funds too, were in the red. The average XIRR (an excel function to calculate the annualised yield) of Large Cap Funds was the highest among the categories, with a return of 5.49% followed by Focussed Funds and Multi Cap Funds, which returned 5.49% and 4.06% respectively. It was not surprising to see Small Cap Funds take a hit, as these category of stocks were heavily beaten down since the beginning of the year. Most of the schemes ended up at the bottom of the list with negative returns (XIRR) in excess of 10%. The top performing SIPs included UTI Equity Fund, ICICI Prudential Focused Equity Fund and, ICICI Prudential Multicap Fund. These schemes generated an XIRR of over 17%-19%. Why is your SIP investment negative when the Fund has generated positive returns on a point-to-point basis? SIPs work on the principle of rupee-cost averaging, which means you can average out the cost of your investments. By investing a fixed amount every month, you end up buying more number of units as the NAV (Net Asset Value) of the fund falls, and less number of units as the NAV rises. By this logic, a SIP works best if the mutual fund NAV falls and then moves back up by the end of the SIP tenure. During such a period, you will have the opportunity to lower the average cost of your investment. When investments turn red, as an investor you tend to wonder whether you have made the right decision. You begin to question the investment choice when on a point-to-point basis the major market indices and even the underlying fund have generated positive returns, but you have suffered a loss of capital. This is why it’s necessary to understand how SIPs work. The basic concept to remember is that SIPs help to average out your cost. Hence, at the time of valuation, if the Average Purchase NAV is lower than the current NAV, you would have generated positive returns. However, if the reverse happens, where the Average Purchase NAV is greater than the prevailing NAV, the returns would be negative. Let’s take the example of SBI Small Cap Fund. Between October 3, 2017 and September 18, 2018, SBI Small Cap Fund generated an absolute return of 9.61%. However, if you invested Rs 1,000 at the beginning of every month through a SIP, the value of your investment would be worth Rs 11,694 as on September 18, 2018, versus a total investment of Rs 12,000. You would have effectively lost nearly 3% of your capital. How did you end up losing your capital when the fund delivered a positive return over the period? Let’s compare the fund’s NAV with the Average Purchase Cost of NAV through SIPs. After the SIP was initiated the NAV of the fund rallied from Rs 50 to Rs 65 in a span of three months. Over this period, each monthly instalment through SIP was made at a higher NAV. The average purchase cost of the investment through SIP increased from Rs 50 to Rs 55. Soon after the NAV of the fund began to correct. Though the NAV fell, the average purchase cost of NAV hovered around Rs55-57. The was a brief period in March and April where the fund’s NAV fell below the average purchase cost, resulting in negative returns for the SIP investment. The correction continued between May-July 2018. But, the average cost of investment remained above the prevailing NAV, resulting in a negative SIP value. The NAV as on September 18, 2018 was 54.49, which was about 9.61% higher than the NAV as on October 3, 2018 of Rs 49.71. The Average Purchase NAV through SIP worked out to Rs 55.92 over the period, thus resulting in a loss of -2.55%. What should you do when investments through SIPs turn negative? 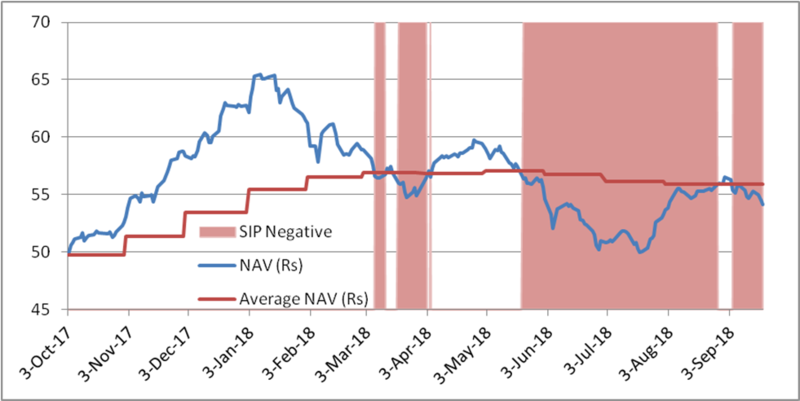 Like in the above example, the reason why most SIP have turned negative over the period is because over the past year, the NAV of the funds gradually moved higher in the initial few months, followed by a sharp correction in latter months. This resulted in a higher average NAV and yes, negative returns of your SIP investment. The SIP will remain negative if the NAV of the fund continues to move lower. However, this provides a good opportunity to lower your average cost of purchase. Such short-term market fluctuations are common. Hence, it is important to maintain a long-term investment horizon in equity investments. Over a period, the market cycle is expected to change and soon the fund would rally upwards with the market. We have seen this happen in the past, hence, is expected to happen in future as well. It may take a few months or even a few years. All that is required is patience. Until that time, it is best to continue your SIPs, especially in such a market situation where you are able to lower the cost of your investment. If you would like to know more about the top performing equity funds to start an SIP, write to us at MFSS@plindia.com. You can check with us on our latest recommendations or send us your portfolios for a free -no obligation review! Contrarian Investing : For the Bravehearted!